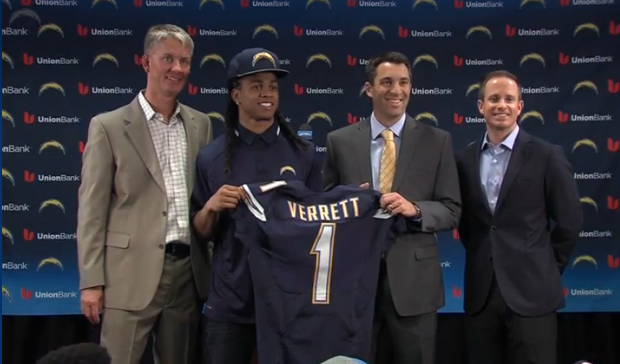 The San Diego Chargers introduce their 2014 first round pick, TCU cornerback Jason Verrett. For the second straight year, the San Diego Chargers traded a 4th round pick in order to move up seven spots in the second round to draft a linebacker. After a making a deal with the Miami Dolphins, the Chargers moved up from No. 57 to No. 50 and selected Jeremiah Attaochu (Ah-tah-choo) out of Georgia Tech. Last year they took Notre Dame linebacker Manti Te'o. Attaochu started in 37 games for Georgia Tech and racked up a school record 31.5 career sacks. He measured at 6-foot-3 and 252 pounds at the NFL Combine, but was unable to perform in any drills due to injuries to his hand and hamstring during the Senior Bowl. With the 89th overall pick in the 3rd round, the Chargers went with Norte Dame guard Chris Watt. Watt is described as a good-sized physical player who has the ability to become a starter. Measured at 6-foot-3 and 310 pounds, Watt is expected to provide depth at multiple offensive line positions.